First we made the poster. Then the torso cover. Then the patch. And you guys asked for a the hat. So we made it! Lift-off! Two styles will be the main offering. 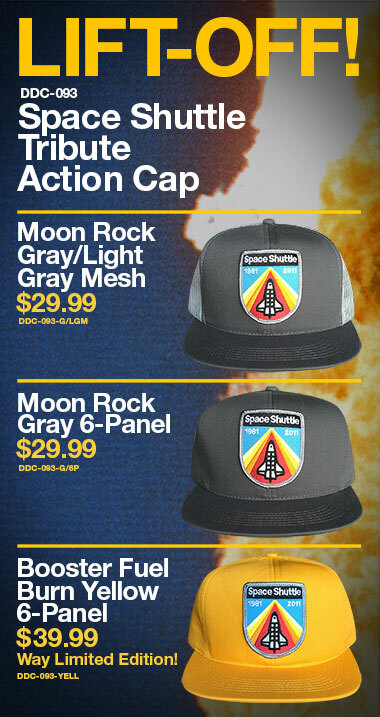 “Moon Rock Gray / Light Gray Mesh” and “Moon Rock Gray 6-Panel”! The “Booster Fuel Burn Yellow” is SEVERELY LIMITED to 72 pieces! ACT NOW, spaceballs! 01. Big, thick-lined shuttle patch. Atmospheric re-entry. Colorful. 09. Made by proud people of the Action Cap. 10. Space Camp, Space Coast, Space Race, Spaceballs. 11. One helluva hat to remember that majestic shuttle program. 12. Fellow “Children of the Space Shuttle,” you need this. 13. Proudly made in the U.S.A.